When I was a boy we received weather reports on the radio. Back then, there were no TVs in our homes, and we heard one or two weather reports a day. There was no technology like today to predict and warn us to be ready for an upcoming storm. 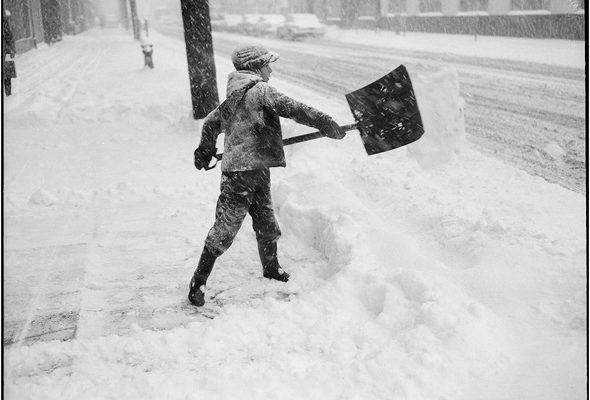 When a snow storm hit we older kids (young teens) came out of our tenements to hang around with friends, maybe have a snowball fight, and wait for the DPW to show up. 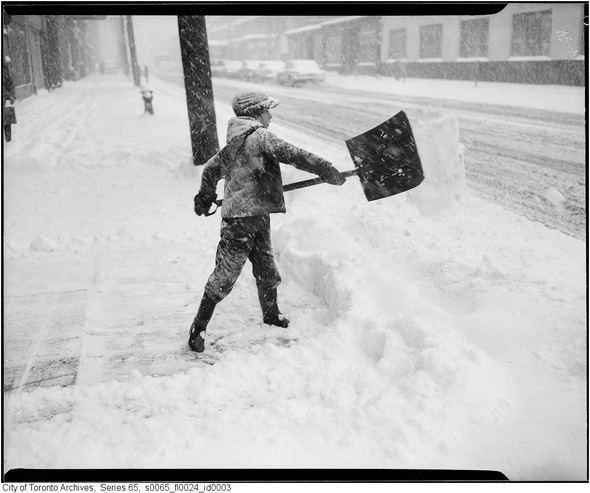 Back then there was little or no heavy duty snow removal equipment used by the DPW. So the snow on our street was removed by teen manual labor. Manhole covers were removed and we shoveled the snow into the New York City sewers. We had a school and church on my street which was an advantage. The DPW was quite punctual in showing up after a storm and our street was one of the first streets to lose the white fluff. The kids were annoyed because there would be no snowmen created, a decrease in snowball fights, etc. But it was to the advantage of street traffic, to church goers and for the youngsters walking to school, provided there was school. When the DPW truck arrived the call went out to interested teens on the street who were willing to work, along with two or three of the neighborhood fathers who would assist in overseeing that the work was done properly and no one fell into a manhole. Each teen was presented with a shovel and given some instructions on what was expected. What was great to hear was that we would be paid for our efforts, a hefty payment of 25¢ an hour. Back then that money came in handy for pocket change to spend at the local candy store, usually on chips, sodas, and egg creams. There were also some teen workers who would turn over their earnings to their folks to assist with the expenses of their household. Back then, none of us had heard of something called a minimum wage. Any income you received was minimum. The snow removal teens on my block were more than happy to see winter arrive and to earn a few dollars from the winter snow storms. It would be been even more beneficial to earn a few dollars during the summer, but that never happened. An idea kicking around was to help with removal of the garbage, but the DPW had plenty of their own personnel to perform that task. Looking back we were all quite glad to participate as part-time shovellers of snow in the winter. As an added bonus, we were fortunate never to lose a soul into one of the manholes and ending up in the East River.